After a few minutes of What does it do? What is on the screen? etc. the real diagnosis begins. Please hold power button for 40 seconds. I already tried that, many times, without success. Ok, but please try it now, I will tell you when to release. Ok. Did it work? No, still stuck on the screensaver. Please charge the Kindle for 15-30 minutes, I will wait for you. I have already gone through several full charge/discharge cycles. Please charge the Kindle. Ok. 20 minutes later. Please press the power button now. Did it work? No. After over 30 minutes on the phone, tier 2 finally declared my Kindle dead and they would send out another one. But wait, we’re not done yet. To confirm your identity, please tell me the last four digits of the credit card you used to purchase the Kindle. Uh, I use several cards but I soon found the correct card. I need to mail a return mailing label to your wife’s email address [to whom the Kindle is registered]. What is her email address? Oy, she has a long email address, success after 5 attempts. Please verify you received it. Hold on, I need to find a machine I can use to read my wife’s email. Confirmed. The new Kindle arrived on Monday, already registered to my wife’s account. Again, very impressive. Now I just need to return the dead one. This entry was posted in eReaders and tagged Amazon, customer service on 2015/06/17 by robert. 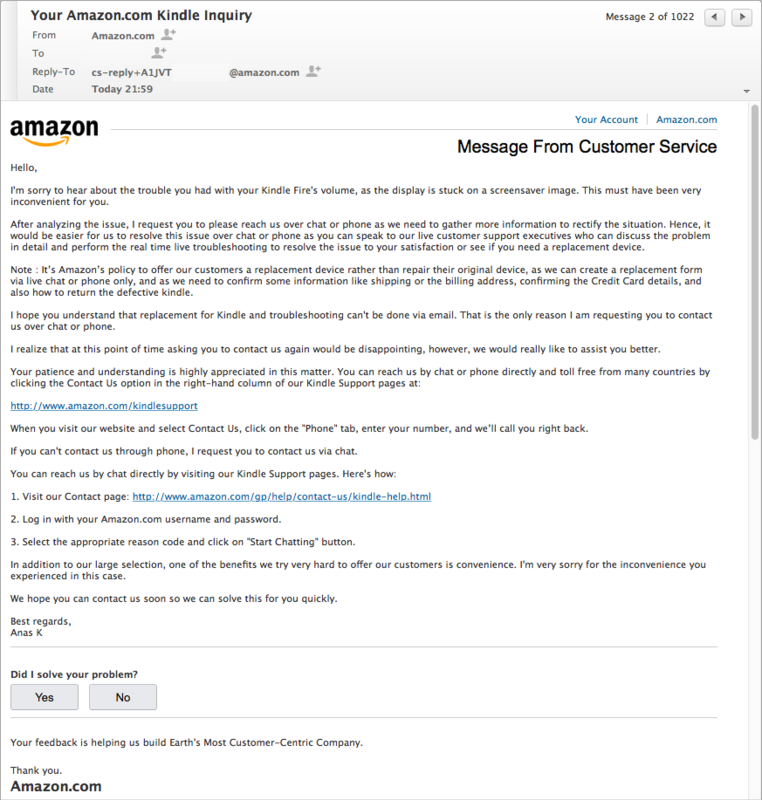 Wow, can this really be Amazon’s boilerplate response email? First, I said “my Kindle Voyage does not boot” along with the order number in my email but that became my “Kindle Fire’s volume” in their reply. And then there is the rest of the message. Current phish from Nigeria has better grammar and style than this. I cannot believe Amazon has not provided their customer service representatives with better content. This entry was posted in Computers, eReaders and tagged Amazon on 2015/06/09 by robert.